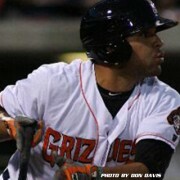 FRESNO – Fresno Grizzlies catcher Johnny Monell has been selected to participate in the 2013 IGT Triple-A All-Star Home Run Derby, Triple-A Baseball announced. Monell will be among six participants, three from the Pacific Coast League and three from the International League, in the Home Run Derby, which will take place on Monday, July 15th at Aces Ballpark, home of the PCL’s Reno Aces, at 7:05 pm PST. Monell, 27, is tied for fifth in the PCL with 15 home runs this season, and his .571 slugging percentage is second-best in the league. Over his seven-year career, the Bronx, New York native has hit 72 home runs. He has 10 or more home runs in each of his last four seasons, including a career-high 19 in 2010 with Class A Advanced San Jose. The other PCL participants include Matt Davidson of the Reno Aces and Brock Peterson of the Memphis Redbirds. Peterson is pacing the PCL in homers with 20. For the International League, Chris Colabello (Rochester), Mauro Gomez (Buffalo), and Ernesto Mejia (Gwinnett) will take part in the home run competition. In addition to the six Triple-A participants, Kody Reynolds of McQueen High School in Reno will also compete in the Home Run Derby. Reynolds advanced from a field of 16 high school hitters who competed for the spot in the derby over three rounds held on April 28th, June 2nd, and July 3rd. Monell, who is in his first full season at the Triple-A level, was one of three Grizzlies players named to the PCL mid-season All-Star team earlier this month. Brett Pill was voted to the team as the designated hitter while outfielder Roger Kieschnick was selected as a reserve. Also, Grizzlies pitching coach Pat Rice was named as a coach for the PCL All-Star squad.